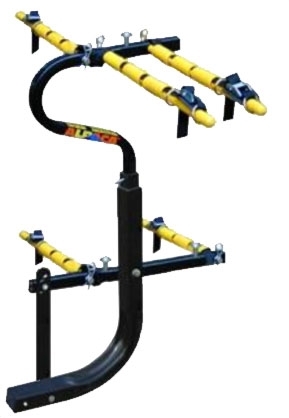 The 1500 1 Delta 1 Tadpole Customized will carry one Delta Trike and one Tadpole Trike on vehicles with a 1.25 inch, 300 pound tongue load rated hitch, a 1.25 to 2 inch hitch adapter or hitch riser adapter available at your hitch retailer, are necessary with this rack. These adapters are for Class II hitches only. The riser adapter will be necessary on vehicles with low ground clearance with a Long.Tadpole Trike. Because of leverage we reduce the hitch tongue load rating by 50% with all Alpaca Racks. Using this standard this rack and the trikes it carriers will exceed the capacity of Class I Hitches in most situations.